If you look at Oregon’s current 5-5 record this season under Willie Taggart and think the results of last two games on the schedule don’t really matter, think again. Better yet, think back to a fateful moment in Oregon football history: December 16, 1989. Playing in the Poulan Weed Eater Independence Bowl that cold evening in Shreveport, Louisiana, the Ducks didn’t just come from a touchdown behind in the fourth quarter to defeat Tulsa. They ended a 26-year postseason drought dating back to the 1963 Sun Bowl. But what Rich Brooks‘ team and us Duck fans didn’t know back in 1989 was that playing in the Independence Bowl would begin a streak that has continued all the way until present day: never missing a bowl for two consecutive seasons. 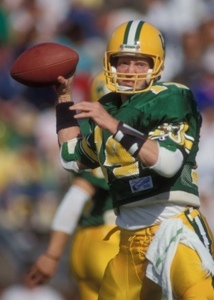 Since that landmark year, led by Oregon legends like quarterback Bill Musgrave and defensive back Chris Oldham, the Ducks have had the occasional losing or bowl-less season: 1991 (a 3-8 record), 1993 (5-6), 1996 (6-5), 2004 (5-6), and of course 2016’s disappointing 4-8 campaign. But through those 28 remarkable years, our beloved team in green and yellow (and often black, silver, blue or sometimes pink) has never had back-to-back losing campaigns and never missed the postseason two years in a row. Given the lofty heights to which this football program has traveled in the 21st century—two national championship games, a Heisman trophy, six conference titles, two Fiesta Bowl wins and two Rose Bowl wins—maybe the idea of playing in a lowlier postseason contest like the Camellia Bowl, the Frisco Bowl, the Famous Idaho Potato Bowl or the Boca Raton Bowl doesn’t sound very exciting. Maybe it even seems like for a recent powerhouse like the Ducks it would actually taint our reputation to participate. Ultimately, though, scoffing at the importance of reaching the postseason in 2017 is a brand of arrogance that the Ducks and we fans don’t need. Let’s imagine for a moment what a 5-7 record would mean. 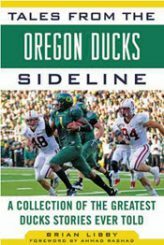 For starters, it would tell us that the drought Oregon is experiencing isn’t just two years and counting, but the worst rough patch in nearly three decades of Duck football dating back to the Reagan administration. It would tell us that Taggart has his work cut out for him more than we previously understood. It would tell us that, even if 5-7 is a game better than 4-8, we might not yet have bottomed out. It would tell us that getting blown out by the likes of Washington and potentially even beaten by the Beavers in the Civil War was still very much a worry. It would tell us that some of those stellar four-star recruits Taggart and his staff have received non-binding verbal commitments from might start to waver a little bit. If you’re a great high school player from, say, Florida or Texas or California, and you’re receiving offers from Top-10 programs all over the country, wouldn’t a second-straight losing campaign at the school you’ve committed to, Oregon, give you as an 18-year-old at least some pause, at least some cause for concern? Don’t get me wrong: I’m quite optimistic about how the Ducks program under Taggart is doing. 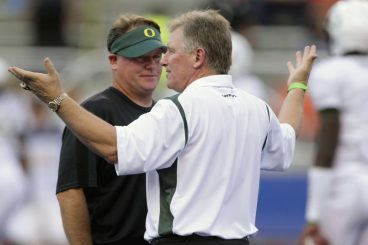 Recruiting is better than it ever was under Mark Helfrich, Chip Kelly, Mike Bellotti, Brooks or any past Oregon coach. The team is playing its best defense in years and starting to control the line of scrimmage in a way even previous talented, NFL-bound linemen could not. Most of all, the team plays together and with a sense of swagger. Samie Parker, Ryan Schmid, and Keenan Howry at the Fiesta Bowl. Even so, the future is always unwritten, and a football team’s fortunes are always like a house of cards: no matter how high it gets built up, the whole thing could still come crashing down. Winning seven or even six games this year would tell us that the foundation remains robust, and that there’s reason to believe we can build a new house of cards that reaches the “Promised Land” of the College Football Playoff. Watching this season’s struggle to stay above .500, I think back to some of those aforementioned single seasons since ’89 without bowl appearances—and, just as importantly what they led to. That disappointing 3-8 campaign of 1993? 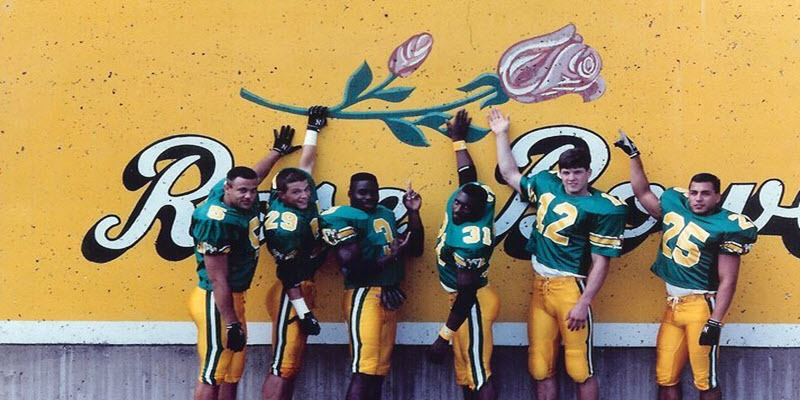 It was followed up by what still may be the most magical season in Oregon history: the Rose Bowl campaign of 1994. The disappointing 6-5 season in 1996? It wasn’t a losing season, but coming off Rose and Cotton Bowl seasons it was certainly a disappointment to not even make the lowliest of bowls. But it led to five consecutive winning seasons that ended in bowls, culminating with the extra-special 2001 campaign led by Oregon’s first-ever Heisman finalist, Joey Harrington, and the Ducks’ first January bowl win (the 2002 Fiesta Bowl) since 1916’s victorious Rose Bowl season. That lone losing season in Mike Bellotti’s head-coaching tenure, 2004? 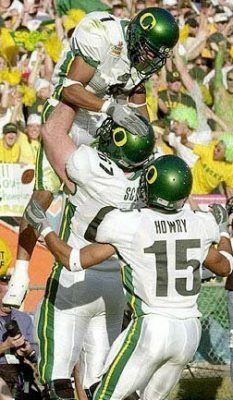 It saw the Ducks go 10-1 the following year and begin an 11-year bowl streak that included the greatest moments in Oregon football history. All of which to say that winning five, six or seven games is not just three variations on mediocrity. To finish strong is to show us that the best—under Willie Taggart, and perhaps in all of Oregon’s history—is yet to come.